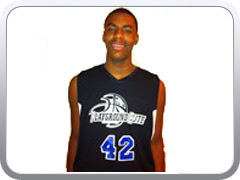 Javonni Bickham is a 6’5 forward in the Class of 2018. It’s only right that he wears number 42 because when I saw his footage he reminded me of a miniature Elton Brand. He has a decent face up game near the foul line and can pat the rock enough to drive past defenders. If he stretches out a few more inches his stock should rise even more. His AAU squad seems to be Playground Elite but in this video he's rocking with Team Sizzle.